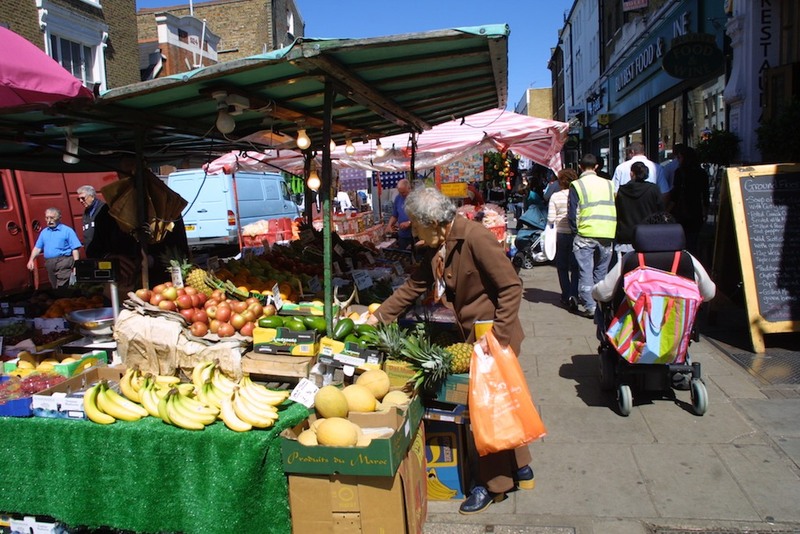 Ethnic minorities comprise approximately 30 percent of London’s population, and Notting Hill is one of the metropolis’ most popular melting pots. In this funky multicultural community, you can practically circumnavigate the globe in terms of cuisine without walking more than 20 minutes in any direction. Read on for details about some of the best foodie offerings in this hip west end neighbourhood. Like a Noah’s Ark of nosh, Notting Hill seems to offer not just one, but at least two of everything. Spanish tapas? Check. Lebanese? You bet. Indian? Absolutely. Thai? It’s so common, it’s often served in the pubs. And Italian? Please! There are four Italian restaurants clustered within just two blocks on Kensington Park Road. To the shock and gastronomic ecstasy of many visitors, Notting Hill even features two very popular Mexican restaurants. Tortillas are made fresh daily at Taqueria. At Taqueria on Westbourne Grove, compact portions pack a spicy punch. Corn tortillas, made fresh daily on the premises, are plated in pairs and filled with creative combinations like char grilled pork with pineapple and coriander or avocado mash with cactus. Mexican wrestling masks back the stainless steel bar, where mix-masters serve up potent margaritas made from 100 percent blue agave tequila and fresh lime juice. Taqueria’s relatively minimalist atmosphere is juxtaposed against the cozy camp at Crazy Homies on Westbourne Park Road, where the décor tends towards Day-Glo Day of the Dead and portions are super-sized without sacrificing quality. So forget the shepherd’s pie, and bring on the tacos. 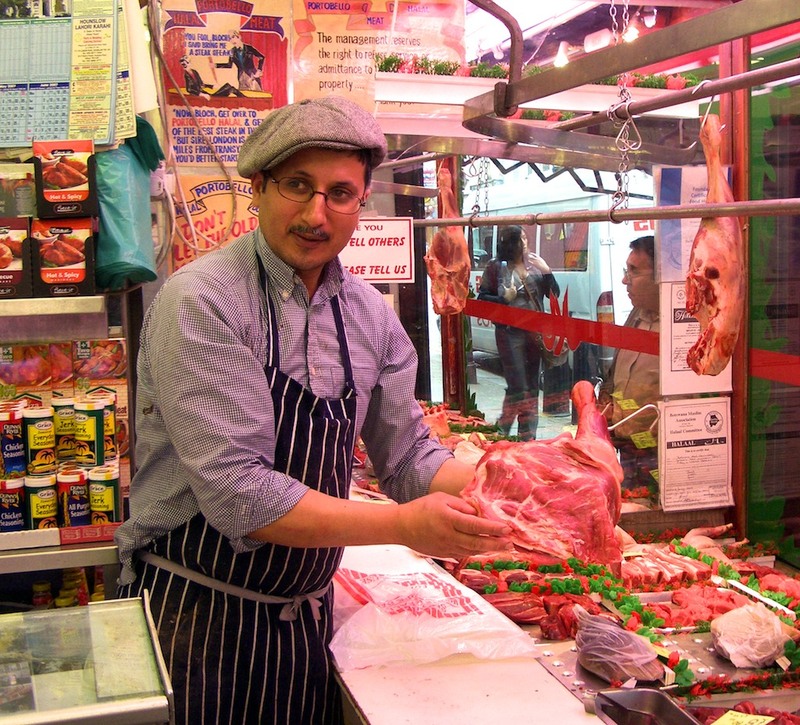 Atiq Zaman of Portobello Halal Meat, where meat is prepared according to Islamic law, credits the Notting Hill Carnival with fueling the neighborhood’s immigration boom. Up to one million people from all parts of the globe attend the Mardi Gras-style Caribbean carnival every August. “People came from outside, saw friendly, helpful people looking after each other, liked what they saw and stayed,” says Zaman, the British-born son of Kashmiri immigrants. “Once a few stayed, others started to gravitate,” he explains. Portobello Road, whose very name conjures images of big meaty mushrooms, is the appropriately clogged central artery running through the neighbourhood. Not only is it flanked by restaurants of every description, but it’s also the site of one of London’s most famous markets. The street is lined with carts heaped with fresh fruit and vegetables Monday through Saturday, with limited hours on Thursday. Produce ranges from standard provisions like apples and oranges to more exotic offerings, including dasheen, marinated olives and mouth-watering sandwiches made of mozzarella, basil and tomato served on soft, spongy focaccia. 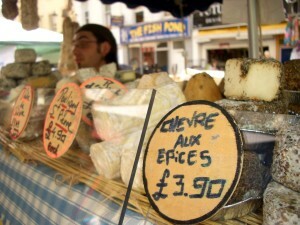 A French cheese stall on Portobello Road. Two of the neighborhood’s most unusual culinary offerings—Books for Cooks and The Spice Shop–lie just west of Portobello Road, on Blenheim Crescent. Books for Cooks is entirely devoted to, you guessed it, cookbooks. The shop, run by French chef and cookbook author Eric Treuille, stocks more than 10,000 titles, which are primarily categorized by country and region. Staff members, hired as much for their culinary skills as their retail experience, regularly teach workshops upstairs. 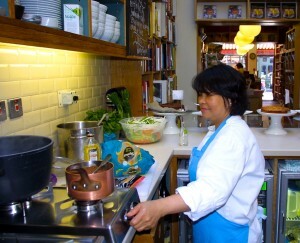 They also prepare recipes from different cookbooks, serving lunch in a café at the back of the store. “We try to be as organic as possible,” says Treuille, whose staff arises early every morning to procure fresh ingredients from the Portobello market. Of course, there are some ingredients featured in Treuille’s collection of cookbooks that might require adventurous diners to go further afield. On one visit, I spied a bright green pocket-sized booklet near the register bears the intriguing title “Why Not Eat Insects?” This tiny tome by Vincent M. Holt, originally published in 1885, contains an entire chapter devoted to “Insects That Are Good To Eat, and Something About Their Cooking.” Consider this little nugget of culinary insight regarding grasshoppers. “Having plucked off their heads, legs and wings,” Holt writes, “sprinkle them with pepper and salt and chopped parsley, fry in butter, and add some vinegar.” Mmmm, mmmm….good? While neither grubs nor grasshoppers are likely to make it onto the Books for Cooks café menu, with the proper seasoning, you can make even the most unlikely dishes delicious–and if they don’t stock it at The Spice Shop, it’s probably not worth tossing in the pot. 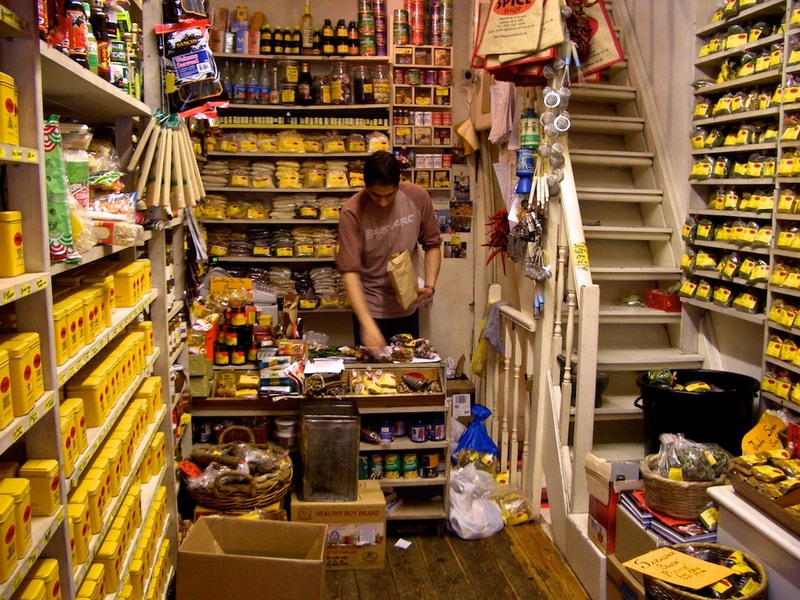 Located just across the street from Books for Cooks, The Spice Shop’s bright yellow storefront lists ever so slightly to the left, as if slumping beneath the weight of the more than 2500 spices, blends, herbs, and roots and crowded upon narrow shelves that stretch nearly to the ceiling. Further north, Portobello Road intersects with yet another major foodie thoroughfare, Golborne Road. A hub of both Portuguese and Moroccan culture, Golborne is presided over by a pair of Portuguese patisseries, a Portuguese grocery and a myriad of African portable food carts slinging kabob sandwiches and hot soup. “This is my version of McDonald’s,” says Sham Raihara, between bites of a Moroccan chicken, salad and egg sandwich at a Golborne Road food stand known as Cass’ Place. “It’s fast, and it’s a bit of your country at the same time, innit?” notes the affable engineer, whose parents emigrated from Morocco ten years before he was born. Though Raihara’s accent is pure British, part of his heart—or at least his stomach—clearly remains rooted in North Africa. Fortunately, he hasn’t far to go to enjoy a taste of home. Getting to Notting Hill: Notting Hill Gate and Ladbroke Grove are the two nearest Tube stations. Visit the Transport for London website to help you plan your route. 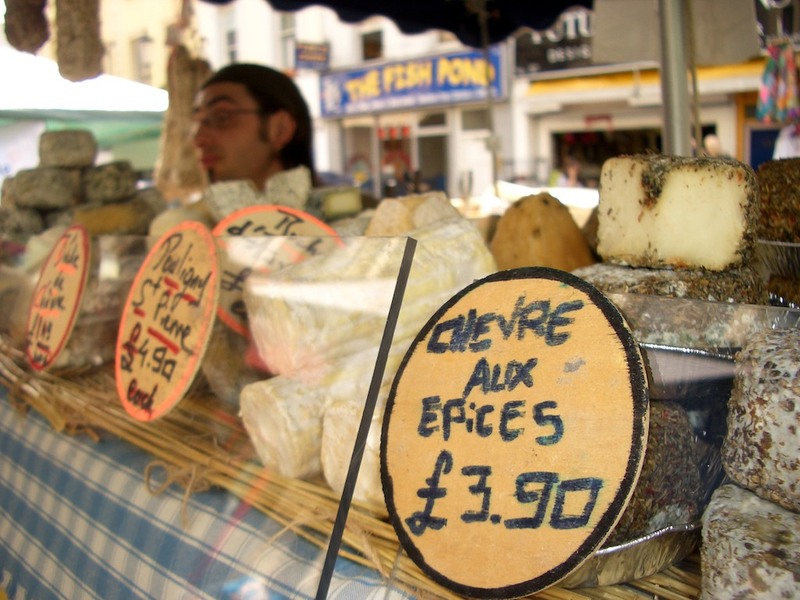 Below you’ll find details for some of the ethnic restaurants and specialty food shops around Notting Hill. I’ve marked my personal favourites with an asterisk. Notting Hill Tandoori, 23 All Saints Road, W11 1HE, phone: +44 (0)207 727 9999, www.nottinghilltandooriuk.com. , W8 7TQ, phone: +44 (0)207 727 8800, www.malabar-restaurant.co.uk. *The Oak, serving wood-fired pizzas downstairs and killer cocktails in an elegant bar above. 137 Westbourne Park Road, W2 5QL, phone: +44 (0)207 221 3355, http://theoaklondon.com. *Osteria Basilico, 29 Kensington Park Road, W11 2EU, phone: +44 (0)20 7727 9957, www.osteriabasilico.co.uk. Essenza, 210 Kensington Park Road, W11 1NR, phone: +44 (0)207 792 1066, www.essenza.co.uk. Luna Rossa, 190/192 Kensington Park Road, W11 2ES, phone: +44 (0)207 229 0482, www.madeinitalygroup.co.uk. Mediterraneo, 37 Kensington Park Road, W11 2EU, phone: +44 (0)20 7792 3131, www.mediterraneo-restaurant.co.uk. 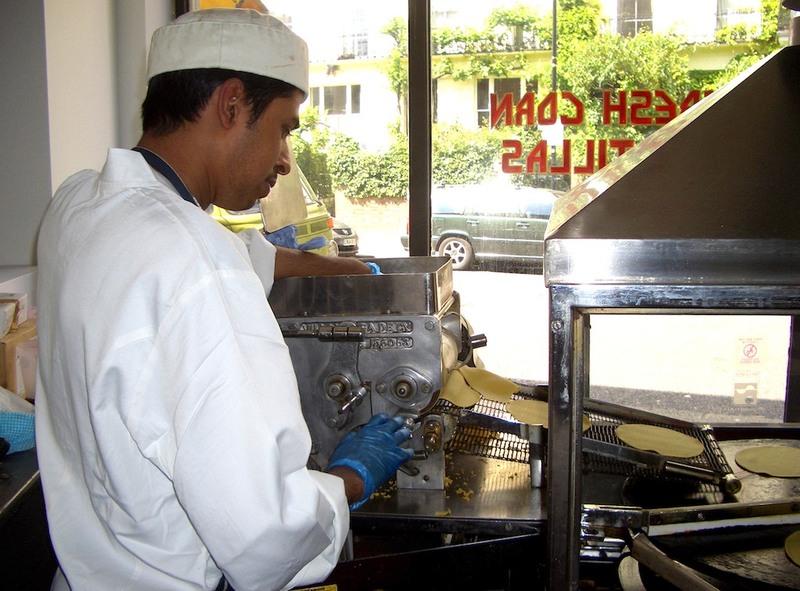 Al Waha, 75 Westbourne Grove, W2 4UL, phone: +44 (0)20 7229 0806, www.alwaharestaurant.com. Taqueria, 139-143 Westbourne Grove, W11 2RS, phone: +44 (0)20 7229 4734, www.taqueria.co.uk. *Alounak, technically a bit outside Notting Hill, but worth the few extra steps. 44 Westbourne Grove, W2 5SH, phone: +44 (0) 207 229 4158, http://alounakrestaurant.co.uk/house-menu-westbournegrove. Café O’Porto, 62A Golborne Road, W10, phone: +44 (0)20 8968 8839. Lisboa Patisserie, 55-57 Golborne Road, W10, phone: +44 (0)20 8968 5242. *GinTonica at The Distillery, serving Spanish tapas as well as more than 60 gins. 186 Portobello Road, W11 1LA, phone: +44 (0)203 034 2233, http://www.the-distillery.london/gintonica/. Galicia, 323 Portobello Road, W10 5SY, phone: +44 (0)208 969 3539. La Plaza, 74 Tavistock Road, W11 1AN, phone: +44 (0)207 229 5995, www.laplazatapasbar.com.